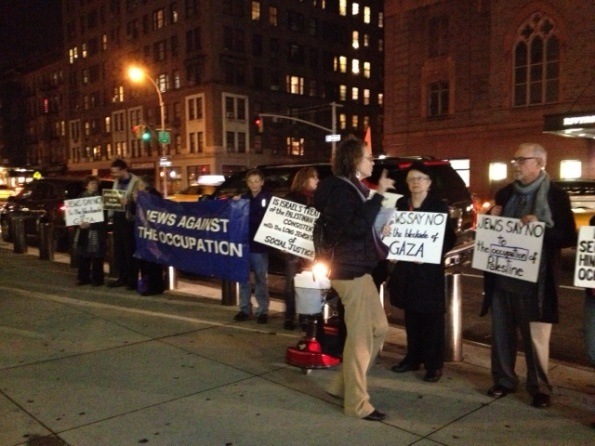 Israeli Ambassador Michael Oren spoke at the Jewish Community Center on the Upper West Side last night, and more than a dozen protesters organized by Jews Say No! stood out on Amsterdam Avenue to protest his appearance and talk to passersby. The group told the JCC administration that it wanted their voices heard inside the community center, and the voices of others who support Boycott, divestment and sanctions. This entry was posted on December 5, 2012 at 6:17 pm and is filed under Uncategorized. You can follow any responses to this entry through the RSS 2.0 feed. Both comments and pings are currently closed.